His Excellency Prime Minister and Commander-in-Chief of the Armed Forces, Dr. Haider al-Abadi has confirmed that the army proved that it was fighting under one banner and it was firm against Daesh's terrorist gangs, at the same time it was kindness with the citizens for that it did deserve the respect of all. 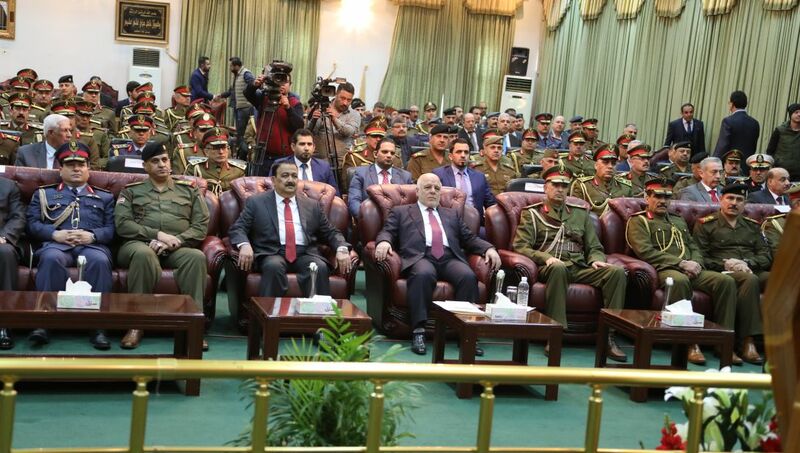 This came during a ceremony held on Saturday in the Ministry of Defense on the occasion of the 97th anniversary of the establishment of the Iraqi army, where his Excellency has renewed his congratulations to the Iraqi army's heroes on this occasion, which coincides with the victory over gangs. Dr. Haider Al-Abadi has said that the prestige of the army has returned because of its sacrifices and where its soldiers and commanders of all formations did the fighting, with that it become welcome in all areas after the citizen was disappointed. Corruption and terrorism are linked together and without countering the corruption terrorism will return. Dr. Haider Al-Abadi has stressed on the unity of our heroic forces, pointing out that in our unity we achieved the victory which has become talked about by the whole world. His Excellency has said, "I am very proud of this heroic army". Dr. Haider Al-Abadi has said that we can make miracles in our unity, the next phase is for reconstruction and construction, and we will win it as well as we have won against terrorism.